A fine and impressive antique Victorian English sterling silver photograph frame; an addition to our christening silverware collection. This fine antique Victorian sterling silver photograph frame has a plain rectangular form with an oval shaped internal window. 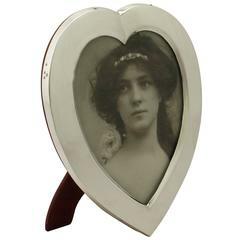 The surface of this antique solid silver photo frame is plain and embellished with an impressive bright cut engraved and pierced decorated entwined ribbon design to the internal window. The decoration to the frame incorporates a ribbon bow to the upper and lower portions. This fine example of antique silverware is fitted with an impressive oak frame back and hinged strut, securing with two swivel catches. 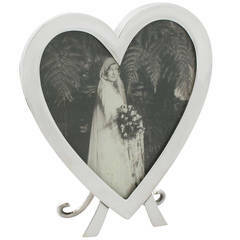 The photograph frame is inset with the original removable glass panel. 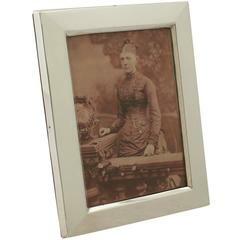 Condition: This antique solid silver photo frame is a very good gauge of silver and excellent quality. The silver frame and wood back have been professionally polished and are in excellent presentation condition. The bright cut engraved decoration is very crisp. Full hallmarks struck to the surface of the rim of the frame are all very clear. Dimensions: Height 16.3cm/6.4" Width 11.8cm/4.6" Height of internal window 13.6cm/5.4" Width of internal window 9.2cm/3.6" Maker: William Comyns & Sons Origin: London, England Date: 1893 Video: A video of this fine piece is available upon request. Reflections in photographs may detract from the true representation of this piece of Victorian silverware. This frame is a very good gauge of silver and excellent quality. The silver frame and wood back have been professionally polished and are in excellent presentation condition. The decoration is crisp. Full hallmarks are clear.